Photos here are courtesy of Amanda Smith and Kevin James Tully of A Smith Gallery. 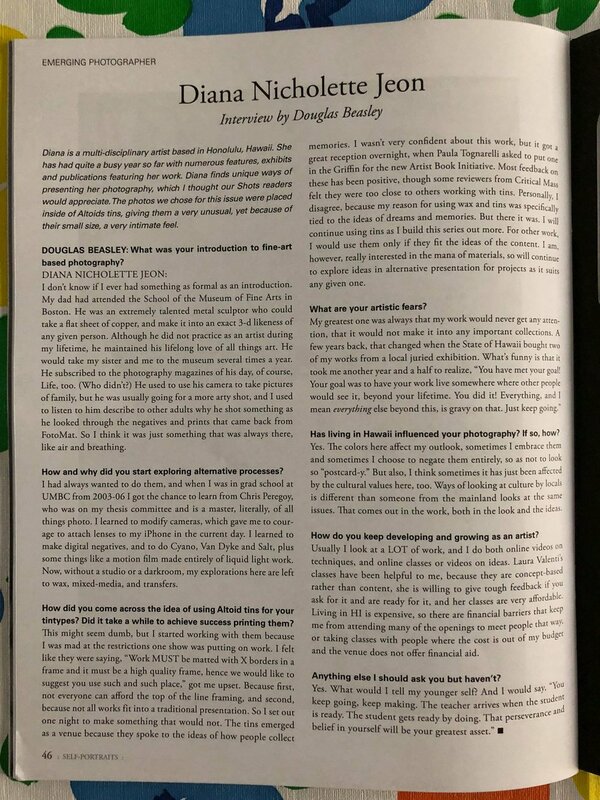 I'm over the moon thrilled to have been selected for the Emerging Artist feature in the Spring issue of Shots magazine. Mine hasn't arrived in print yet, but I did get this photo of it from Joshua Sarinana. Thank you so much to the team at Shots - Elizabeth, Douglas, and Deborah - for your faith in my work. I'm greatly honored, especially since it was my first time getting work into this magazine, too! The 10th Julia Margaret Cameron Awards finally went online this week. (They had sent out email with the winners on the 31st.) In case you don’t know, it is an award honoring JMC that is open only to women. I had entered for the first time this year, and was sort of disappointed in the the results, that I didn’t place at all with a series that had placed well in a few other competitions. So, when I saw the then I saw Armineh Hovenesian’s post saying she had gotten an award, I clicked the link. Once there, I looked around. As a photo editor and educator I always appreciate the opportunity to see the multitude of entries in photo competitions. To look through thousands of photographs representing different styles and themes in one sitting is a valuable experience for both the juror and the photographer, even if one’s work is not selected. The photographers are given a chance to think about how their work functions on a more universal level in front of a larger audience and use that experience to further refine how they edit and present a series or an iconic image. In KK Pauls´s (errors in the statement not my typing) winning series, Only Child, I was struck by the work’s sculptural qualities. The construction element of layering photo paper materials seemed to compliment the complex family situations that motivated KK Paul to create this personal body of work. After viewing the images, amongst hundreds of others, the collage technique, and her effort to express her feelings about the child, resonated with me on some level. I was inspired by how it felt more like an object, something tangible almost malleable, like the delicate feelings in the work. The images raised my curiosity and left me asking questions. And in the jurying process, it´s always a series that leaves one wanting to know more, whether it’s a comfortable feeling or not, that rises to the surface. I am haunted by her work myself, so I appreciate the juror’s words and choice of winner. I'll be the Art Lunch presenter today at HISAM. If you are in the neighborhood, please come here me talk about my journey doing live "backwards" than most people, and how that led to the mobile work I'm most known for now. Yesterday here I Photolucida I met with reviewer Elin Spring. Today she featured my work in hser blog post about a first glance at the best of Photolucida, Day 1. Feeling truly blessed and very happy. You can see her article here. I'm beyond happy and excited. I'm beyond thrilled to announce that In the In-Between Journal of Digital Imaging Artists has featured by Self-Exposure series. In the In-Between is an artist-run web and print publisher that highlights artists working at the intersections of photography and digital media. The primary mission of In the In-Between is to serve as a research platform for the photo-arts field to examine contemporary artists exploring the uses, concerns and consequences of 21st century image technology. Through interviews, project reviews, portfolios and essays, our features explore the properties, theories and applications of digital-based imaging in a field largely referred to now as the post-photographic. As we enter into the third decade of the digital era, we believe digital imaging is, and will continue to be, the defining characteristic of 21st century photographic art. In the In-Between seeks to understand and disseminate relatively new attitudes and methods of such image-making; and to understand how they are being used to examine the world at large. I feel so lucky to have my work featured alongside so many great digital imaging artists. A huge thank you to editor/publisher Gregory Jones. Recently I learned of a Big Island of Hawaii based photography exhibition, but late in the morning a day after the deadline for entry had passed. This was the first timeI just learned this venue had opened the event to photographers on all islands rather than strictly the big island. Jung received a BFA in Photography from The San Francisco Art Institute and an MFA in Photography from the Massachusetts College of Art and Design. His artwork has been featured in numerous publications including The Boston Globe, Incandescent, The Photo Review, Mossless, and Kiblind Magazine in France. He was a recipient of the TMC Kodak International Film Grant in 2009 and Saint Botoph Foundations Emerging Artist Award in 2013. Jung has participated in exhibitions throughout the United States including The Griffin Museum of Photography in Massachusetts, Houston Center for Photography in Texas and Foley Gallery in NYC. His work is in the permanent collection of the Los Angeles County Museum of Art. I wrote to the venue via their FB page, asking if they might consider a late entry. The person told me that they would, but that I had to have it in by the close of business that day. There wasn't really a 'great category' that my image fit.. I was unsure. As the minutes of the afternoon waned, I decided to enter, but just the one image, and to use "Portrait" as my category from the choices they had for the entries. I shot with an iPhone 5s encased in a cheap vinyl case I purchased at TJ Maxx a couple years ago for $10. Seriously. I shot while swimming around in the pool at Turtle Bay Resort,. As I was unable to see the screen, I was shooting as was using an oatmeal box. camera. Tonight I learned that my work had been selected by the juror.he first image I worked with from that shoot was the one that got in; it is called Stroke. I was so happy with it, and the other two I have finalized to date that I decided I will work on a series of these images. As I type, I am on Maui, in Kaanapali, taking advantage of a a 5 day visit to shoot more images in the pools here. The image that will be shown is this one below. This is the first time my work will be shown on the Big Island. Diana Nicholette Jeon - New, and different than usual for me, work. about water. I decided at the last minute to enter a juried competition about water. I have done a ton of work about water, but it was always about its usage in tourism and agriculture here in HI. This, this was just plain fun. Here are the images; I took these on Sunday at the pool at the Turtle Bay Resort in Kahuku, O'ahu, HI. I did an overnight stay with my family that night. It paid off, it seems. I am very happy with the work. Bu more importantly, I just had fun, and I think it shows in the work. Perhaps I need to go to Turtle Bay more often. Yes. That's it. All off the images are of strangers to me, so, in effect, "Street Photo." Yes, I know they are not on a street. But in HI, water is often a form of street. I shot with an iPhone 5s encased in a cheap vinyl case I purchased at TJ Maxx a couple years ago for $10. Seriously. It is NOT the camera, it is the artist. As if that discussion has not been done to death. But, I shot these swimming around, unable to see the screen, and pretending I was using an oatmeal box. I needed to take a breather from the more serious subjects that my last few series address, so I decided to make some work that was strictly fantastical these past few days. Here is the final version of the first image from the several pieces I am working with. Tonight 6-9 pm is the opening for #Photolucida's The Elevated Selfie-Beyond the Bathroom Mirror. If you are around the Astoria, OR area, go to #LightboxPhotographicGallery and check out what promises to be a great exhibition. It's up until June 7. Wish I could be there tonight; two of my images are being shown. Nadine Wu of the Honolulu Advertiser did a great feature on the show in this morning's Star Advertiser. You can make it larger by clicking the image of it above. It all adds up to one show you do not want to miss. So, even if you cannot make the opening today, you should go visit before the month is up. You won't be sorry. And yes, best of all, for me, is that is my image, Nature Girl, in the top left in the banner.